I said I would be letting you in on a few Bead & Berry trade secrets, and I’m going to share one recipe with you today. It’s a unique combination of juice and smoothie that you won’t find anywhere else. I love juices, and I love smoothies. Juices have the advantage of bringing all the nutrients of fruits and vegetables directly to your bloodstream. And because juices are so concentrated, you can pack more nutrients from a large quantity of produce into your body in one quick shot that would take hours of equivalent chewing. Smoothies, on the other hand, keep the fiber from the plants because you blend the whole food, which is great for your body. Because the effect of juices enters your bloodstream more quickly, your blood sugar levels can spike and then drop. 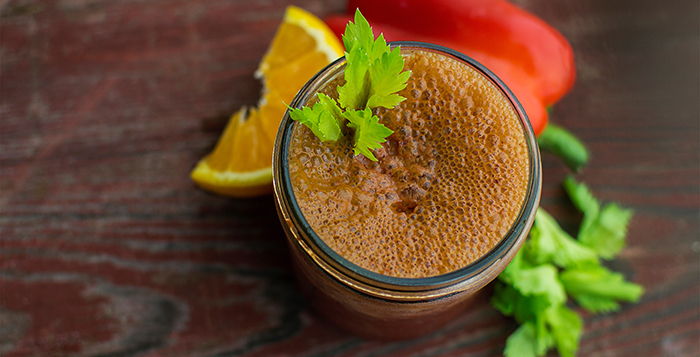 The fiber in smoothies helps your body keep its blood sugar levels constant longer. So I tried to create a drink that would give that quick impact of a juice, but would maintain the fiber for a longer effect. Enter the SmooJuice. This one is the cherry pepper, and most of the ingredients are known to fight inflammation, especially of joints in the body. Use frozen coconut water instead of ice. Coconut water has five naturally occurring electrolytes that naturally hydrate the body – so everything in this SmooJuice has a good purpose. Juice the first set of ingredients using a juicer and citrus press, and then blend with the rest of the ingredients. Enjoy! 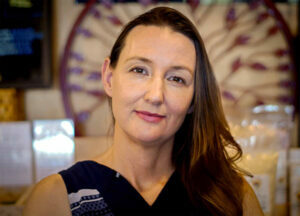 Claire Bullivant is the owner of Bead & Berry Coffee House. This column appeared in the April issue of InMaricopa.